Have you ever heard somebody say something like that or had that conversation? I’m sure you have. Even though it sounds cliché, maybe you ponder it as well; I know they’re in my thoughts. Having a bucket list isn’t something new and whether it pertains to hunting, fishing or even seeing the sights of the world, we all have one. There was a time that I wanted to set foot in every state in the U.S. I’ve gotten close – 42 out of 50, which isn’t too bad. Maybe someday I will. The baseball fan in me also wants to see every major league ballpark before I die. I haven’t yet – not even close – but it’s still something I’d like to do. Hunting and fishing, and more specifically chasing a certain species, is the same way. Many have accomplished such dreams, completing Super Slams of this and that, whether here in Alaska, North America or around the world. But of all the guys and gals who have accomplished these feats, I’ve never heard one say they were done or didn’t have something else that was on their list. In Alaska, a bucket list can be long and take years to accomplish, but the chance of success is readily achievable and can be done under the right circumstances and with a determined set of goals. Surely there are many of you out there who scoff at the idea because putting meat in the freezer and enjoying time with family in the outdoors is all you need. I envy that and respect those individuals who chase that dream. Heck, for most of us, that is what we all want to do anyway. But there are some of us who like to pursue different species and test our skills against the elements, the environment and the animal itself. I know I do. I also think that a person can do both – have fun and stock the family larder. WHEN I FIRST ARRIVED in Alaska, I wanted to hunt caribou more than anything else. I dreamed about it for years and to be honest, caribou are what drew me to the part of the state I live, Kotzebue. The Western Arctic Herd was huge in those days. If you wanted one, this was the place to be, but they were hard for me in the beginning. It took three years before I had any luck. Though the bull was small, I was happy that I had accomplished my goal. I’ve taken many since – more than I can count – but it was that first small bull that holds the fondest memory. Next on my list was moose, the holy grail of hunting for many here in the state and even out of state. Moose are big, formidable creatures that can weigh close to a ton, and until you’ve been close to one you can’t fathom their sheer size. What’s more impressive or more intimidating is the amount of work it takes after you get one down. Hunting them is a grand experience, but when they say the work begins after the shot, they’re right! I was able to mark moose off my list early, in only my second year living here. Like that first caribou, the bull wasn’t big; he was small, but with subsistence rules and wanting moose meat, I pulled the trigger and filled the freezer. He was and still is the best eating moose I’ve taken in all my years here in the Arctic. Young bulls always are. Even though I could cross him off, I still yearned for that magical 60-incher that everyone talks about. I searched, hunted and explored every inch of Northwest Alaska trying to find one, but I never had the opportunity until many years later. Before then, however, I was lucky enough to tag along on many moose hunts and kills with friends and family, ones where big bulls seemed to fall in their laps. It was incredible to see: huge bulls, some over 60 and 70 inches, were taken, fulfilling their dreams of taking “the big one.” I shared in those accomplishments and that was enough, but like I said, it was only recently that I accomplished that same goal. MOOSE AND CARIBOU WERE the big two for me, and for many there isn’t anything else or better. But eventually your mind starts to wonder, what else can I add? What other opportunities are there where I can be successful and, if so, can I do it locally? Or do I have to venture off to other parts of Alaska in order to get it done? And that is what’s great about the Last Frontier; yes, you can! Alaska is big, with an abundance of wildlife spread across the state. Combining this with following the rules and having the right tags, most of us have the ability to hunt those species wherever we choose. Bears came next for me. With such a large population – one that seems to be ever increasing – black and brown bear both came off the list pretty early. I was able take my first grizzly here in the Arctic 20 years ago, then a brown bear on Kodiak, plus numerous black bears down south. They were fun hunts and something I’ve truly enjoyed. I do know that taking a grizzly bear or at least hunting for them is on the bucket list of many people. Over the years I’ve been told numerous times by hunters everywhere that “hunting a grizzly” is the number one animal they want to take. They also ask if I have a guide license. I don’t. Most hunters know that as their list gets shorter, each item requires more effort on a wide variety of fronts. Maybe it’s time and money due to those species being very expensive to hunt and requiring a lot of time to achieve the goal. Maybe it’s the tag and the difficulty of drawing one in order to just get the chance to go. It could be any of the above, but for the most part – and you can bet on this – it will involve mountains and your ability to climb them, or at least conquer some obstacle. ANIMALS LIKE WILD SHEEP AND mountain goats are lifelong dream hunts for most, but for some they aren’t at the top. They’re down a bit for me – say, No. 9 or 10. It’s not that they’re tougher to bag or harder to kill. Rather, it’s getting to where they live and then outsmarting them. That is only half of it, as you still need to get them field dressed and back down the way you came up. It’s just a fact of life and isn’t for everybody. I was lucky with sheep. In the old days and not that long ago, we had a very healthy and populous herd here in the Arctic. Numbers were good, which allowed us to hunt sheep on a subsistence tag just about every year. They’ve since dwindled due to weather and a variety of other reasons and the season has been closed. It was a blessing, though, and the five rams I did take in those days accounted for some of the greatest and most adventurous times of my hunting career. Sheep hunts are like that – experiences that aren’t really about killing, but about accomplishing goals and enjoying the time there. However, if you do get lucky and get to mark a sheep off your list, then you’ve really accomplished something. Like sheep, hunting mountain goats has become very popular these days in Alaska. A lot of guys are achieving that goal every year. With ever increasing numbers you can hunt them just about anywhere, and on Kodiak Island the population has exploded. Tags are pretty simple to get, and with a two-goat limit, why not? Nonresidents still need a guide, but bagging a goat isn’t as tough as it used to be. You may have read my recent goat experience (Alaska Sporting Journal, November 2017). It took me three trips to get it done, but I finally did it. Though I was successful and it was the pinnacle for me, I don’t want to do it again! THERE HAVE BEEN PLENTY of other goals on my list that I’ve been lucky enough to fulfill. Muskox for one, but only due to where I live and the ability to draw a tag. Many say you get one every year and I do, but it took me 10 years of filling out endless applications to get my first one. It has been a blessing and the meat from these guys is the best in the business. Lately muskox have become my moose for the year. Like many, I’ve taken wolf, fox, lynx and the underestimated snowshoe hare, and yes, they were all on my list. But there are also a few others that have eluded me. Buffalo, or bison, is one of those and at the moment ranks at the very top (as it does for many Alaskan residents). The Department of Fish and Game has done an excellent job when it comes to the bison herds we do have. Due to excellent conservation methods and management practices, the herds have expanded, which has produced some incredible hunting if you’re lucky enough to draw a tag. I have not, even though I’ve been applying for years. Maybe next year. A bucket list doesn’t just apply to big game; it can also include waterfowl and even fish. I know several sportsmen and -women who devote their entire outdoor experience to chasing ducks. With all the species we have here in the state, it’s a no-brainer. These dedicated waterfowl hunters value the experience just as much as they love to pursue our feathered friends, and they know their stuff. 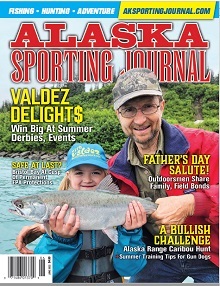 If you don’t believe me about the fishing effect, head to southern Alaska during late spring and summer. Anglers from all over the world come to fish these waters in hopes of hooking a world record or in most cases just catch a variety of species that you can’t get anywhere else. Some even travel the state in pursuit of taking the “Salmon Slam,” or come up here to the Arctic in hopes of landing a few of our species. Like I said, most bucket lists are long and varied. These days, my list is much shorter, but there are those species that I would still like to chase. Bison, as I mentioned, but there are others. Polar bear is one, but not until I win the lottery and get my passport updated to hunt them in Canada (subsistence hunt). One of the more common ones however, or so they say, is the wolverine. To be honest, I’ve only ever seen one in all my years up here and that was while I was camped on the Omar River cooking breakfast. We were hunting caribou and he decided he liked bacon, I guess. Before I could reach my rifle, he was gone, but it was still cool to see.